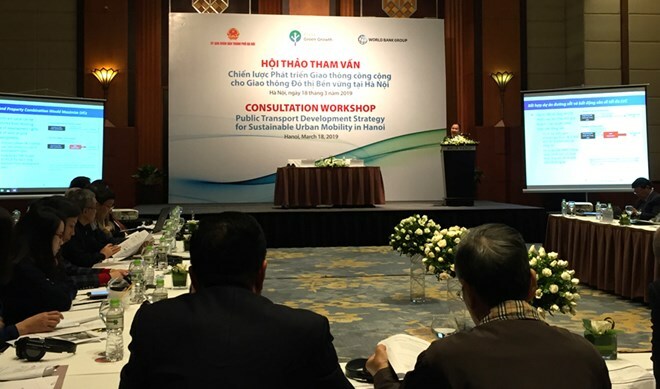 Hanoi (VNA) – The Hanoi People’s Committee, in collaboration with the World Bank, held a Consultation Workshop on Public Transport Development Strategy for Sustainable Urban Mobility in Hanoi on March 18. The event attracted the participation of both domestic and foreign scientists and representatives from related departments and sectors. Addressing the event, Vice Chairman of the municipal People’s Committee Nguyen Quoc Hung said that being aware of the importance of transport in urban development, the municipal People’s Council approved a project on intensify management over public vehicles to reduce traffic congestions and environmental pollution in the city for the 2017-2020 period, with a vision to 2030. The city has paid attention to public transportation, and considered one of the main tasks to develop urban transport sustainably. Therefore, through the consultation workshop, the city wants to listen to ideas and recommendations of domestic and foreign scientists and managers, and learn from other countries’ experience, Hung stated. According to World Bank experts, to achieve sustainable urban development, it is essential to better the public transportation network.